This picture of caste-based oppression is at odds with common perceptions of modern India as an economic tiger and IT superpower. Few Dalits have reaped the benefits of the recent boom, due to lack of education and ongoing discrimination that mocks the outlawing of 'untouchability' in the Indian Constitution. 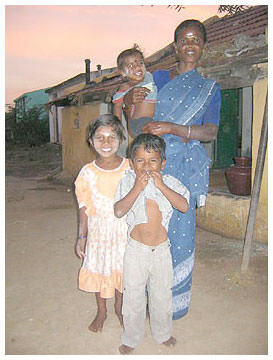 The Dalits in Moses' village are isolated on the eastern side. 'When the wind blows, the wind of the Dalits should not touch the upper-caste people,' explains Moses. Visiting the village shop, he had to stand at a distance so the shopkeeper would not be contaminated. 'When I asked for something from the shop they used to pack it and throw it. If I catch it, I catch it, otherwise things would fall on the ground and we have to collect them from the mud.' Similarly, payment would be thrown to the shopkeeper and the change tossed back. Children growing up under such conditions develop a sense of inferiority. That is precisely the intention. 'There were many times, I was told I am a Dalit and equal to any other animal,' says Moses. Freedom, to some extent, came when he moved to the city, where his caste identity wasn't so obvious from his family name. Further emancipation came from his study of the Bible; he took solace in the Christian perspective that, contrary to his upbringing, everyone is born equal. Moses married and has a young daughter. With his colleagues at the All India Christian Council and Operation Mercy Charitable Company, he is working to educate Dalit children and help Dalit families develop economically, so that his daughter may grow up in a different India. There is a positive correlation between abuses of Dalits and regions where there have been improvements in the living conditions of Dalits. With extremist Hindu groups like Rastriya Swam Sevak Sangh and Vishwa Hindu Parishad unlikely to back down, further empowerment will come at a cost. Still, Moses is committed. 'I want to work with my people, help them, encourage them.' For Moses, there is no next life. He decided long ago to make the most of this one. Peter Hodge works as a teacher and freelance journalist. He is the author of Volunteer Work Overseas for Australians and New Zealanders.